Update, April 2014: the demolition of the building is due to begin shortly. Burnholme Club/Burnholme WMC, or to give it its posher name, Burnholme Hall. A striking building, which once had extensive grounds. It still has a fairly large open area around it, which is soon to be built on. Housing is planned for the site, and a new club house, more fit for purpose than this one is. It isn’t a Listed building, but it does appear on the ‘Local list’, yet to be formally adopted by the council. It’s a landmark building, and a charming one, rather a surprise in the middle of suburban housing on a much smaller scale. It has been used as a social club/WMC for many decades – since the 30s, apparently. A speedway track was built on part of its estate, around 1930. This only lasted for a year or so. The houses of Burnholme Ave had covered the area by the later 1930s. It’s a late 19th century house, built by W G Penty for John Bellerby. The Local List describes it as ‘a fantasy villa’ with extravagant towers and stained glass windows. I wonder why so many Working Men’s Clubs ended up occupying these large old houses. The Lawrence St WMC was another in a grand old house. And as with Lawrence St, this building is obviously too expensive to maintain. They don’t make them like this anymore, that’s for sure. Worth trying to save this building by lodging an objection to the planning application? Design and Access Statement (PDF – large file) (helpful for overview of the application and includes some history of the house). Information on the York Speedway track came from this website on defunct speedway tracks which uses text by David Poole, apparently a chapter from a book, though it doesn’t say which book. It’s worth a read, and includes a reference to the 1930s club house holding a ‘smoking concert’. How times change eh? Thanks to Frank Ormston for alerting me to the existence of the Burnholme track. ‘It is recognised that whilst the existing building on site has some merit, it is not listed or in a Conservation Area’ – that’s an impressively circular argument. ‘It has merit but that merit has not been statutorily recognized so it can be treated as if it has no merit’. This is a significant building. Penty (name spelt wrong in the Design & Access Statement) was an important and able York architect and Burnholme is an individual and impressive interpretation of high Victorian Gothic. The connection with the Bellerby family (name also spelt wrong in the Design & Access Statement) gives it additional importance for York. If it’s ‘dwellings’ they want surely this building could be converted? I get the impression that local residents don’t feel it’s worth saving, which is surprising. Haven’t got the time just now to read all the information, hoping readers will share on here any further info and thoughts. – when York was badly damaged by DVDs of a 1980s TV drama falling from the skies. Or something. We all make mistakes, of course. Hopefully these days fewer of those mistakes involving demolition of distinctive buildings. We shall see. I was born just up the road from here and as children we gave it a very wide berth “because it was haunted”! It is actually a rather handsome building if a little faded now but it would be a shame to pull it down to erect a purpose built “box”. Fascinating to learn that a speedway track was begun in that area too, thankyou. I would think that these big old houses were popular because the early clubs needed a number of rooms for the various educational and recreational activities they supported along with one or two large function rooms. At the same time large residential houses in cities became unfashionable. When Samuel Tuke died Lawrence Street would have been a very different place to when the Tukes moved in. (think Regent Street). When it was sold at auction it was the land that had the value not the house. Building a large estate of industrial housing in its back garden would have further reduced its residual value. As well as proving ideal for club premises it would also have been cheap. The most impressive York building that was once a York workingmen’s club? I suggest upstairs at the junction of Market Street and Feasegate (above H. Samuel) until sometime in the early 1960’s occupied by the Anglers WMC. Another of those buildings that people never really look up and notice as they rush from shop to shop. It would be an absolute shame to demolish such a fine building as Burnholme Club only to replace it with a number of box like structures with no character in the name of housing. Buildings like Burnholme Club should be preserved and cherished as their like will never be built again. I spent much of my childhood playing in the grounds and exploring the many rooms within the building itself, great memories. In my opinion it should be listed and renovated to its past glories. Long term loss and short term gain for a few builders with no attachment to the area. Seems this building is currently being demolished. Surely such a fine historic building would have made a fine building to be converted into swish flats with lots of character? I naively thought we stopped demolishing fine buildings in the 1970s. How sad that this is York 2015. 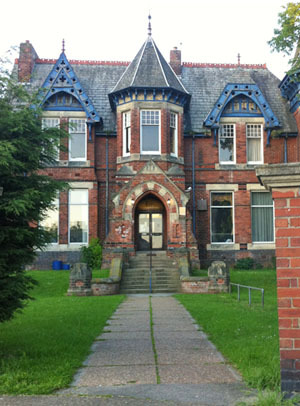 I cant help but think such a building in London would have been saved and converted, so why not in our historic York?